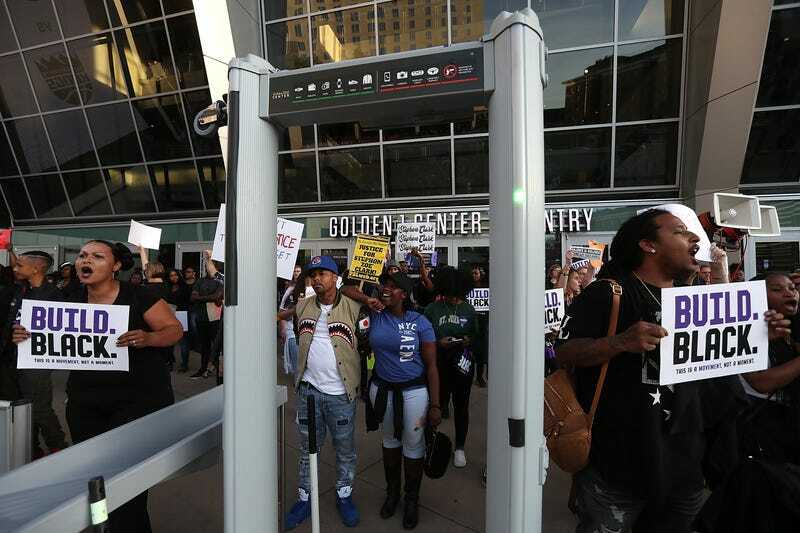 Black Lives Matter protesters block the entrance to the Golden 1 Center where the Sacramento Kings are playing on March 27, 2018, in Sacramento, Calif. Black Lives Matter protesters took to the streets as hundreds packed a special city council at Sacramento City Hall to address concerns over the shooting death of Stephon Clark by Sacramento police. The Sacramento Kings are really standing up with and for their community, announcing plans to partner with Build. Black. Coalition and Black Lives Matter Sacramento to “fundamentally transform Black communities through deep investment in Black youth” in the city. “This fund cannot fix the issues that led to the death of their father, but it will secure opportunities for their futures while the family and the city grapple with healing,” the release read. The Kings have been extremely active and vocal ever since Clark was brutally gunned down in his own backyard earlier this month. While administration has had to close entrances to the Golden 1 Center twice in the past week because if protests, the team appeared on their home floor over the weekend wearing T-shirts honoring the 22-year-old and calling for accountability in his death. The team, alongside the Boston Celtics, also released a PSA calling for action during a Sunday game. In addition, former Kings player DeMarcus Cousins reached out to Clark’s family to offer to pay for his funeral. “To support transformational change for Black communities in Sacramento, the Sacramento Kings are creating a multi-year plan in partnership with the Build. Black. Coalition to support the education of young people and to provide the workforce preparation and economic development efforts needed to truly #BuildBlackFutures,” the release added.